The download doesn\'t work, sending me to an \"ERROR 404\" page. Does anyone have a link for it else where that I could use? 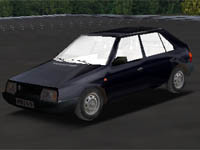 Im cannot download this car please REUPLOAD.Im search Skoda 1201 to Racer in good version please help to me. Im cannot download this car please REUPLOAD.Im search Skoda 1201 to Racer in good version please to me. I don't own one now but I have an Skoda Estelle 120L and it is GREAT !!! Pedro Try to make a Skoda Estelle for Racer Please !! My favorite car for racer, plz new ini. I can't d/l it! Bah! Anyone got it and prepared to email it to me? I don't know why, but I really rather like the idea of chucking the Skoda around the Eville rally track..
All cars, tracks, reviews, articles & tools are © they respective authors Page created in 0.039 seconds.